For the most part, it seems that everyone wants to do what is best for the environment. As many are beginning to learn, however, the best thing for the environment is rarely the most convenient. Example: You wake up late for an early morning meetup with your hiking friends. As you are running out the door your realize that your water bladder is empty, and the hose is full of mildew from your last outing. No worries- you can just pick up a couple bottles from the convenience store on your way. Even the best intentions can get mucked up with deadlines and convenience. I’m as guilty as anybody. I have always noticed trash and waste in the outdoor playgrounds I frequent, and I generally try to snag as much as possible as I go. It wasn’t until a group of us concentrated our efforts on Gushi beach, though, that I realized the magnitude of trash that can occupy such a small area. 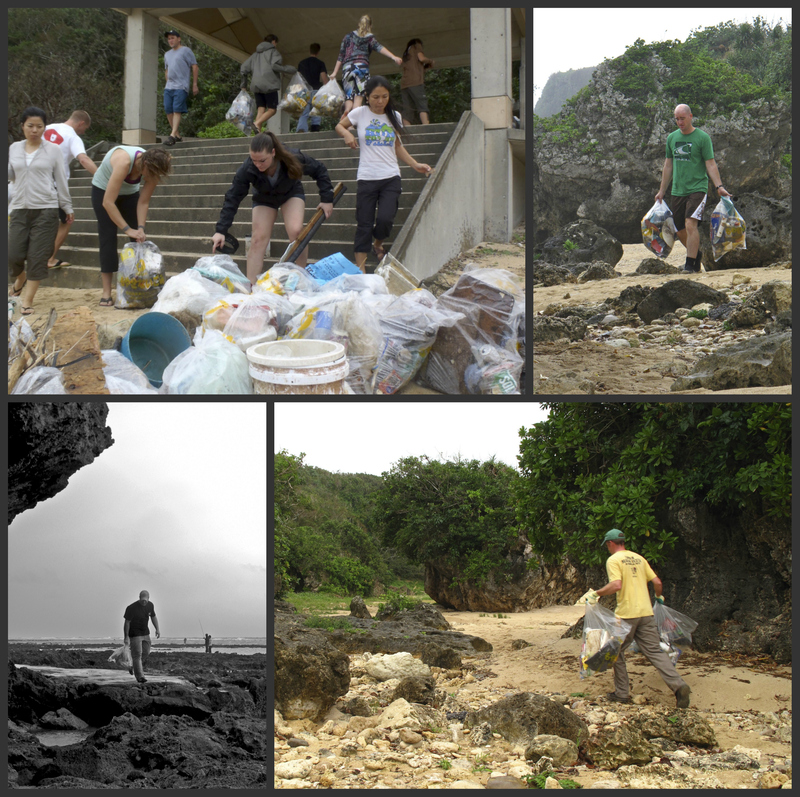 Our efforts were a great success, and everyone was motivated to drag as much junk off of the beach as possible. As promised, the local mayor of Yaese provided bags for the trash, and trucked everything away afterwards to be recycled or disposed of properly. 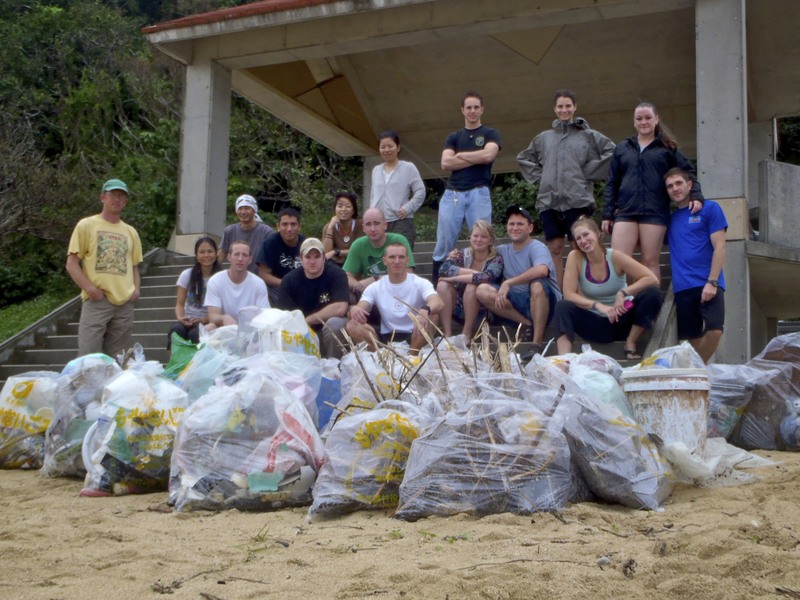 Weight of trash removed from beach: 675 lbs. Plastic bottles and bags were overwhelmingly the most popular items found at Gushi. I would expect that the same is true for most areas around the world (i.e. oceanic “garbage patches”). So is it really that big of a deal? Won’t all that junk just create more homes for the crabs and fish and stuff? It’s a pretty big deal. And though this junk does sometimes create new animal habitats, it may be an animal that is not native to that area. This can easily upset the local ecology. Other impacts include the basic facts that the junk is an eyesore, and wildlife can become entangled nets or ingest or plastics. Humans can be affected in much the same way. I have run across more than one rusty hypodermic needle on beaches. 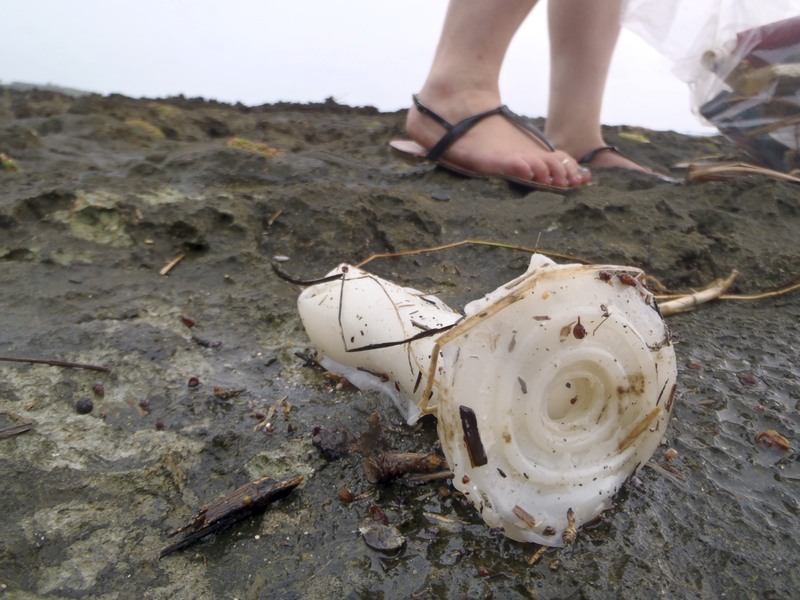 And though the plastics will eventually break down until we cant see them, they never really go away. The disheartening part is that typhoons, currents, and tourists will easily replace our efforts with more junk in a fairly brief period. Beach cleanups like this one really need to happen on a regular basis, so the plastic/sand ratio doesn’t get too out of whack. 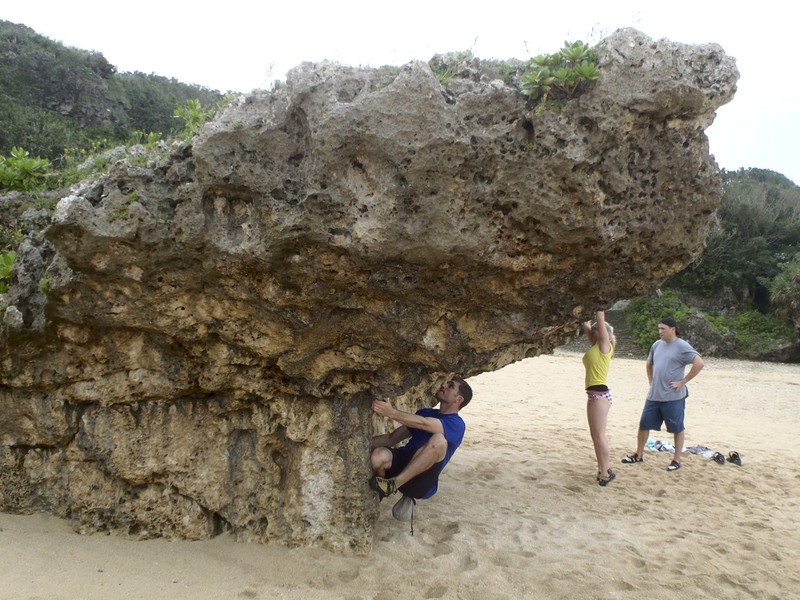 Next in our sights is the north end of Okinawa at Usa beach. Usa is a great camping, climbing, surfing, and diving location that suffers the same wrath as Gushi. My lady bought these for me and the boys for our island adventures. I challenge readers to, at the very least, get a hold of a reusable water container. If you do buy a disposable plastic bottle, try and reuse it a few times. Then, recycle that sucker. Get involved! 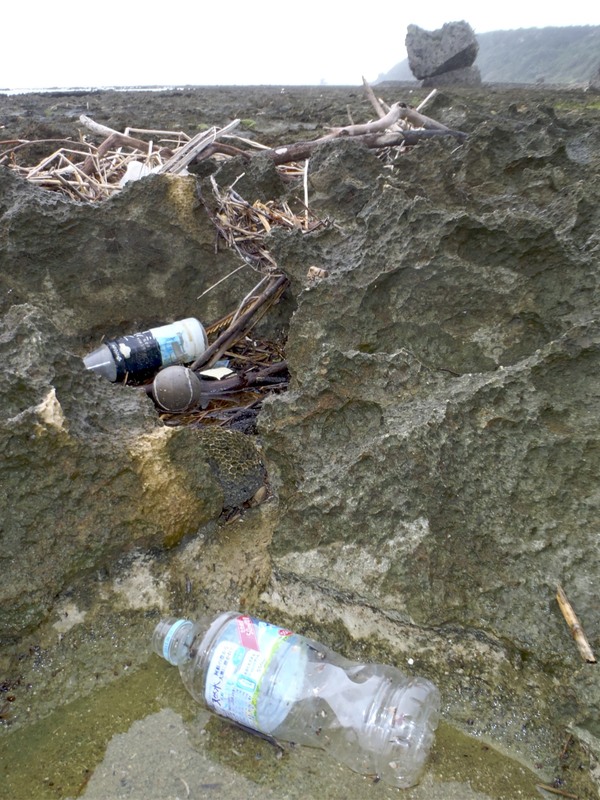 Participate in local cleanups in your area. Recycle as much as possible. Bottles, cans, cell phones, ink cartridges, and many other items can be recycled. Subscribe to Thrive Outdoors to stay in the loop about future volunteer events! 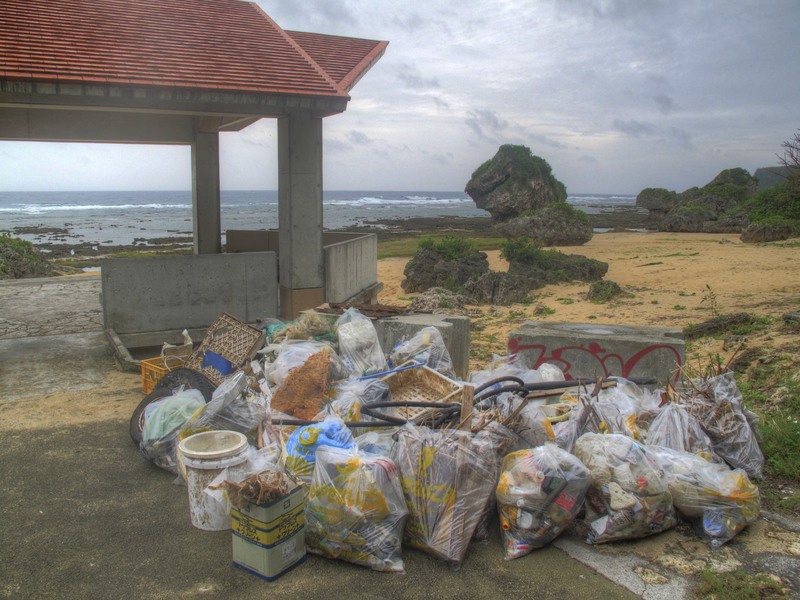 Okinawa readers: Please comment below if you would like to help plan the Usa beach cleanup. I don’t like plastic bottles and I have switched to reusable glass or metal bottles for my water, but I was just wondering if there’s a reason beer and wine has never been bottled in plastic. Everything else seems to be. Thanks for the comment! I do know that PET bottles tend to permeate gasses, and may shorten the shelf life of beer. Dark glass or opaque metal also slows the sun’s affect on the product as well. Glass and metal definitely keep my brew colder longer which is definitley important! Great article! Reusable containers are such a simple solution to a devastating problem. Thanks for doing your part! Much appreciated! We always have a great time. Looks like you have some cool stuff going on as well. I’d like to hear more about it.